Warwickshire County Cricket Club has secured a new deal with leading travel firm, National Express, to become the Official Coach & Bus Travel Partner to the Club and Edgbaston Stadium until at least 2018. From this coming cricket season, National Express West Midlands, which operates the region’s buses, will provide transport links from Birmingham New Street Station and a number of other city locations to Edgbaston on all Major Match days, including this summer’s Investec Ashes Test Match and NatWest T20 Blast Finals Day. Return shuttle services will also operate for Birmingham Bears’ Friday night NatWest T20 Blast group games at Edgbaston. In addition, the partnership includes a package for the Warwickshire and Birmingham Bears playing squad to travel to away fixtures in the supreme comfort of a special executive coach provided by National Express’s sister brand The Kings Ferry which operates luxury private hire vehicles, over the course of the season. 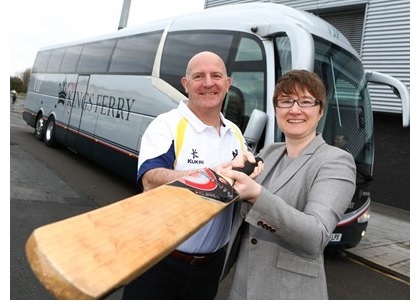 Gareth Roberts, Commercial Director at Warwickshire CCC, said: “The new partnership with National Express will make it easier than ever before for spectators to access Edgbaston, with an enhanced shuttle service running from Birmingham City Centre for Major Match and NatWest T20 Blast games. Edgbaston has a packed cricket schedule for the coming years following the recent Major Match allocation from the England & Wales Cricket Board (ECB). This included an Investec Test Match being staged at Edgbaston each year, until at least 2019, and NatWest T20 Blast Finals Day until 2018. Edgbaston will also host five matches, including a semi-final, in both the ICC Champions Trophy in 2017 and the ICC Cricket World Cup in 2019. National Express UK Coach Commercial Director Sarah Copley said: "Our luxury private hire coaches are the perfect means of ensuring the Birmingham Bears can travel in comfort to arrive rested, refreshed and ready to perform at the top fixtures. Fans can come to Birmingham to see the Bears play using our unparalled coach network that connects almost 1,000 UK destinations and providing people with comfortable, affordable and reliable transport." For further information on tickets for the 3rd Investec Ashes Test Match or other Major Matches at Edgbaston, please visit www.edgbaston.com.